Helen Ramsay was Lawrence Welk's Champagne Lady from 1947 to 1949. Ramsay began entertaining folks in Greater New Bedford when she was just 2 years old. At the age of 3, she made her radio debut on WNBH, as a performer on the Junior Standard-Times program. At 5, she danced and entertained on the Junior Standard-Times float in the 125th anniversary parade of Fairhaven. At 11, she sang over the radio from a Boston station and was one of the entertainers at a War Bonds rally in 1943. By the time she was 15, she was singing with the Lawrence Welk Orchestra. Helen and her younger sister, Ethel, performed regularly in "Stars on Parade," a musical revue staged by their mother, Olive, at the Baylies Square Theatre in the North End, to benefit the effort during World War II. The troupe also brought their act to those in need of entertainment, including the city jail and the mental health institution in Taunton. "I enjoyed performing in Taunton," recalled Ethel, now living in Santa Ana, Calif. "Twenty-five to 30 patients would be sitting in the hall waiting for us. As we walked down the aisle, they would shout out our names. It was quite exciting. It made us perform even better." The sisters attended Abraham Lincoln Elementary School on Acushnet Avenue and Helen attended Normandin Junior High School. When the girls were 15 and 11, respectively, their parents moved to Brooklyn, N.Y., to further their daughters' careers. Helen soon began working at the Sawdust Trail, a small bar and club. Due to her young age, she was forbidden to be a bandstand vocalist in Broadway night clubs. So overnight, the 15-year-old became "18 years old" and took her place with the band. 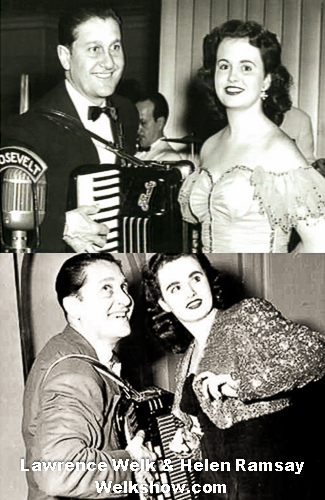 Shortly thereafter, her agent learned that Lawrence Welk, a popular accordion player and orchestra leader, was about to open at the Roosevelt Hotel and needed to find a replacement for Joan Mowery, his current "Champagne Lady," who had decided to leave the orchestra. Mr. Welk needed a singer fast, so Helen auditioned for the spot -- and won herself the job. From 1947-49, the teenager sang and toured with Mr. Welk as the "Champagne Lady," the title given the featured soloist with the orchestra, which was famous for its brand of "champagne music." She also performed with the Lawrence Welk High Life Revue, a weekly national radio program. For the next two years, she traveled across the Midwest with the Welk show. One of her favorite stories of life on the road with Lawrence Welk was at the Cow Palace in Mitchell, S.D., where Victor Borge, the late comedic pianist, was a headliner on the show. As Helen finished her solo, Mr. Borge came on stage and began dancing with the 16-year-old. "Mr. Welk didn't like being upstaged and threatened to fire me if I did that again," she recalls. "The following night, Mr. Borge came out and danced with me again." She didn't get fired -- and she didn't have any fear of Mr. Welk, either. After two years of touring with the orchestra, the 18-year-old Helen grew tired of being on the road and left the band. She began singing with the Bernie Cummins Orchestra in New York and later on the Arthur Godfrey Show. In 1952, she married Johnny Haluko, who performed with the Xavier Cugat Band. The couple moved to Las Vegas where they both worked in the lounges of many of the great hotels. After 20 years of marriage, Johnny died of a heart attack. Their son, John, who was born in Las Vegas, died at the age of 38. Six months after her son's death, Helen's second husband, Russ Lawson also died. Ramsay spent most of her later life in Las Vegas where she worked at the Showboat Hotel. Helen and Ethel returned to their hometown of New Bedford several times as teenagers. In 2002, the two women returned once again, expecting to see a run-down city. "I was quite excited about how lovely the city looked," says Ethel. "It was bright and shiny and my sister and I had fun climbing the rocks along the waterfront." Helen recalled the long-ago fun the two sisters had in the snow, sledding and ice skating, and remembered falling into the pond at Brooklawn Park one winter day not far from their Arlington Street home. 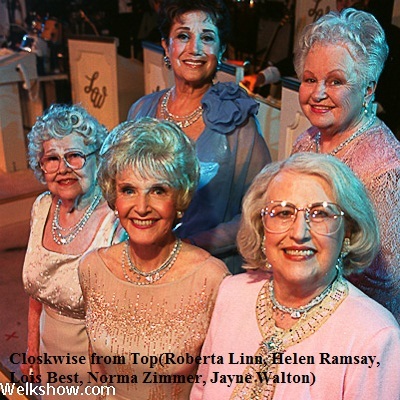 In 2001, Helen featured on a PBS program, "Lawrence Welk, Milestones and Memories." She was introduced at the beginning of the program along with the other original Champagne Ladies and sat on stage with a bouquet of roses as she and the other ladies were serenaded in a tribute to their contributions to the Welk legacy. At the end of the program, she joined with the cast members of the long-running weekly program in a sing-along song fest. "I look back at my two years as the Champagne Lady as the most amazing teenage experience a girl could have," she says. "I wish I would have relaxed more and enjoyed it." Ramsay passed away on April 1, 2004.